The Gamucci products are very basic. You don’t have a lot of options in customization and that will turn off a lot of experienced e-cig users right away. 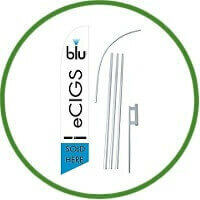 Gamucci electronic cigarettes are convenient and affordable. After the initial investment, you will only need to invest in filters which cost less than buying a pack per day. The Gamucci has really changed in just a couple of years. It used to be a long “pen-style” unit that was very sleek and upscale looking. This was only available in the UK and you had to special order it in the US. Today, they’ve undergone an entire company makeover and don’t carry that unit or any parts for it. Gamucci has focuses instead on a disposable Continental model that’s very low priced and a Micro Kit. These e-cigs both look roughly the same as a “100” type normal cigarette which is a tad longer than a regular one. This is the appeal of Gamucci. You will get a reasonably priced electronic cigarette without a lot of money up front and you don’t have to sort through a lot of different products. What you see is what you get. You can only get regular strength tobacco flavour which also alleviates the difficulty of looking through long lists of flavours hoping you choose one you like. The tobacco flavour tastes pretty close to a normal cigarette. While Gamucci cigarettes are not a product designed to help you quit smoking they are a way to make your habit safer and healthier. Compare product pricing online and the types of devices and filters available and change the way you smoke. Not only are Gamucci cigarettes healthier for you, they are also healthier for the environment and people around you. Does Gamucci Actually Work? Is it A Scam? The Gamucci works exactly as it says and is quite easy to use. It sticks with the classic three piece design that can lead to burnt out atomizers but the ones for sale on the official website are extremely strong and made out of high-grade steel. They can handle quite a bit of abuse. The disposable works well but when the battery dies, you’re supposed to just throw it away. The site claims it will last for 350 puffs which is roughly the amount you’d get from a full pack of normal cigarettes. This is intended to be a “test” e-cig to see if you like them before buying the entire kit and will let you judge the product. It’s not bad but not super impressive either. The Micro Kit works a bit better than the disposable and creates a nice cloud of vapour with the included cartridges. You will definitely want to purchase an extra atomizer and a few extra packs of cartridges so you don’t have a dead atomizer or run out of cartridges at an inopportune time. 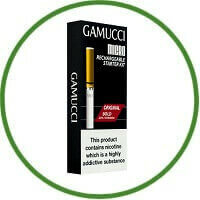 The Gamucci line of products solves a lot of the nicotine side effects by keeping things simple. You can only get tobacco flavour and it comes in one strength, regular. This means you can transition easily from regular cigarettes to the electronic without having withdrawals. The cartridges are pre-filled, so you won’t have to handle e-Juices which can be a mess or end up dripping into your mouth when you puff. The Gamucci products are very basic. You don’t have a lot of options in customization and that will turn off a lot of experienced e-cig users right away. The appeal here is that everything is simple. You don’t have to make a lot of choices and some people prefer that to massive lists of customization options. I’d go right with the Gamucci Micro Kit if you’ve used an e-cig before and are looking to use one more often. It’s easy to use, looks great and produces good vapour. The only turn off you may find is that it’s tobacco flavour only on the website. So, you’ll have to order compatible cartridges from other sites if you’re looking for menthol or fruit flavours. If you’ve been in the e-cig scene for a while, you’ll probably remember Gamucci being one of the most popular brands when they first came out. Now, they may have changed and dropped in popularity but the products are still very well made in the UK and aren’t just Chinese knock offs.